Whether it was a case of a few too many glasses of champagne or just Madonna being her usual outrageous self, the Queen of Pop has been caught on camera, grabbing Kanye West’s girlfriend’s bottom. The 50-year-old singer was papped striking this pose at the star-studded Costume Institute Gala Ball earlier this month. Cosying up with Madge was Mr Trousersnake, Justin Timberlake and girlfriend Jessica Biel. 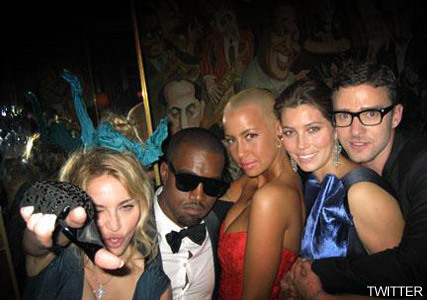 Kanye’s girlfriend model Amber Rose was so chuffed with the party pictures that she posted them on her Twitter page, and in so doing broadcasted Madonna’s antics to the world. However, it appears that the model’s rapper boyfriend doesn’t share her love of the social networking site ranting on his personal blog that ‘Twitter offers everything I need less of’.